It took all 32 minutes of play, but Greely eventually held on and won a tightly-battled game against Mountain Valley, 42-39. It took the teams 3 minutes to score in this one, Greely taking another minute to get the game's first basket. Greely would go on a 6-0 run to take an early 6-1 lead. Mountain Valley would go on a 6-0 run of their own, with Ayla Allen pitching in with a 3-pointer. Greely would hold a slim 9-7 lead at the end of the first quarter. Allen and Caroline Hamilton would trade 3s in the second quarter, as both teams started firing from beyond the arc. Hamilton would finish with 8 points in the quarter, and 11 for the half. Mountain Valley would spread the ball around, with four Falcons scoring in the quarter. At halftime it was Greely with a 21-16 lead. It wasn't until the second half that Mountain Valley hit a 2-point shot, but Makayla White changed that early in the third quarter. Greely's Megan Coale would then score 5 straight points as they tried to get some breathing room. But Mountain Valley would claw back, and a Christine Briggs 3-pointer would tie the game at 28 points a piece. The Falcons would go on an 8-2 run to end the quarter, and lead 31-30 heading into the fourth quarter. Greely would start the quarter on an 8-2 run with big plays by Hamilton and Sara Warnock. 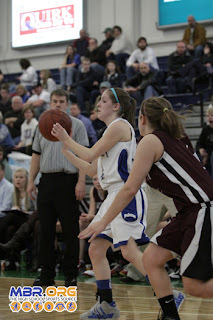 Warnock would score 7 of her 10 points in the quarter as Greely took back the lead. McKenzie Paterson scored 6 points for Mountain Valley as the game go close. With time winding down, and down by three points, Mountain Valley couldn't hit a 3-pointer to tie it, and the Rangers held on. They will now head to the Semifinals at the Cumberland County Civic Center.